Publisher: New York: Hyperion Paperbacks, 2007. My coconspirator. My first true friend. A spirit made of equal parts ambition and razzle-dazzle. A big baritone that slides easily into falsetto. And a future as bright as the lights on 42nd Street. Demi believed that the Wildewood Summer Institute would be heaven. Believed he would be king there, and I would be queen, and we would live all summer in utter fabulousness. And he was right—about himself, at least. Synopsis: Demi and Sarah (whom Demi calls Sadye) are two theatre-crazy teens from a small town in Ohio. Demi is black and gay, Sadye is white and straight, and they are best friends. They are accepted into a summer theatre camp, and, as the summer progresses, life goes uphill with a few rocks in the climb for Demi; but it goes downhill, backwards and sideways for Sadye. Demi has his first real, open relationship with a guy. He is cast in starring roles and he is fabulous. Sadye is unsure of herself with guys, doesn’t do well enough to get the parts she wants, is cast in a very odd interpretation of A Midsummer Night’s Dream, and gets herself in trouble by vocally objecting to and ridiculing her director’s instructions. She mouths off to one of the other faculty members. Things get worse and worse, and finally Sadye is asked to leave the camp. What can she do now? How can she admit her failure? Can she reach out to the people she has hurt? Can she find the true Sarah deep inside herself? I urge you to read this book to find out. I have only skimmed the surface of all that is contained in this fabulous book. 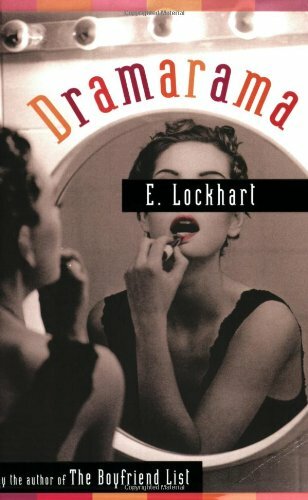 Availability: Unfortunately, Dramarama is out of print. Check your library! I love this book! Perfect recommendation for the day after the Tony awards.